Ex-Great Britain international Harris believes the Warriors won't rush into making an appointment following Shaun Edwards' decision to U-turn on his commitment. 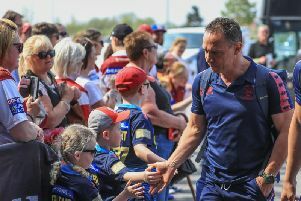 Harris, formerly Shaun Wane's assistant coach, told the BBC's Super League Show: "I think they have to give Lam a period of time to settle in. "It's been an inconsistent start. He's had a lot of injuries and the scores haven't gone for him. I think they have to be calm, as Wigan generally are as a club. "Give him a period of time to stamp his authority on the team and give himself a chance to get the job long-term." Sky Sports' Brian Carney, though, thinks Wigan should make a decision swiftly. "It's a difficult part of the season and there's a question mark on whether they give it to Adrian Lam or give it to someone else, and that's a decision they have to make and probably pretty quickly," said Carney, who was far from impressed with the way Edwards conducted himself by putting himself in the show window. "I think he should reflect on how he has conducted himself throughout this," Carney told Sky Sports. "I would be very surprised, if he does that, that he can turn around and say 'Yes, I've conducted myself both openly, transparently and with the best interests of Wigan at heart' - because I don't think that has been the case."